Think of a posh café with a wide variety of delicious food on the lunch and dinner menu priced expensively and located in a busy city street while at the back of the same building lies another clean food joint serving hygienic wholesome nutritious meal at street price to day labourers--- sounds impossible? It will not be so once you go through Dr Muhammad Yunus' “Building Social Business”, where he shows how you can turn your passion into a business not for building individual wealth but for a better community. Divided neatly into nine chapters the book wisely does the work of transforming dreams into reality. In the introductory part Dr Yunus relates the story of Grameen Bank, the banker to the poor and how microcredit or microfinance has revolutionised financial theories, has garnered economic growth, contributing to poverty alleviation in the last five decades. Drawing examples from the recent global financial crisis, he deduces that “Poverty is an artificial, external imposition on a person. And since it is external it can be removed.” And Dr Yunus's tool for removing poverty is Social Business. He says: “Real human beings that all of us know will be delighted to create businesses for selfless purpose.” The selfless purpose of business forms the core of Social Business as it has to be “a non-loss, non dividend company”, but sustainable and dedicated entirely to a social cause. Now the question rises why would anyone invest in a company that pays no dividend. 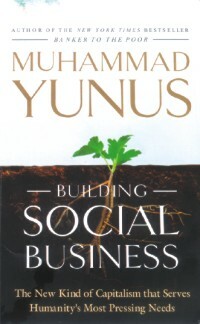 Yunus answers this in the first chapter saying social business holds the key to the numerous problems you see around yourself everyday. He does not suggest you solve all of these problems at one go. In fact throughout the book he keeps on reminding social business entrepreneurs to start at a small scale, to try and solve one problem at a time, and to start with the community if possible. He also defines the philosophy of Social Business and how it is different from charity, social enterprise, non-profit organisations and government's social welfare programmes. He even moves on to calling Social business as a new form of capitalism. The theoretical debates of the first chapter develop into the story of Grameen Danone, the first social business, developed by Dr Yunus in collaboration with Groupe Danone, in the second chapter. It presents an exciting business case of experimentations, failures and successes and reading through it makes you realise the prospect of this incredible concept. The third chapter almost condenses the entire entrepreneurship course in its thirty-six pages; explaining how you can convert your passion into specific business goals; where to start; finding partners; deciding on the social objective and even questions for setting up a business plan. If you had enough theory by then, the next chapter thus provides another business case of Cure2Children and Grameen Healthcare Trust, that aims to bring cure of thalassemia and other blood related expensive disease to the poor people of Bangladesh through cross subsidisation. Cross subsidisation and other more innovative funding methods as well as legal aspects of social business are explained next. The book also presents the case of Grameen Veolia Water, another social business, which is currently at work in Bangladesh. Despite all the reading if the social business idea still remains incredulous, chapter seven offers the solution. It talks about the different institutions worldwide that make up the backbone of the concept either through consultation, research or education. The application of social business to solve economic problems at a larger scale is also presented in the book with examples of a town in Columbia, Albania and Haiti. Dr Yunus, like a true dream seller, ends the book with his promise to build a poverty free world. Even a hard-core sceptic would find it difficult not to dream once the magic of Dr Muhammad Yunus' words as presented in the book start to make sense.